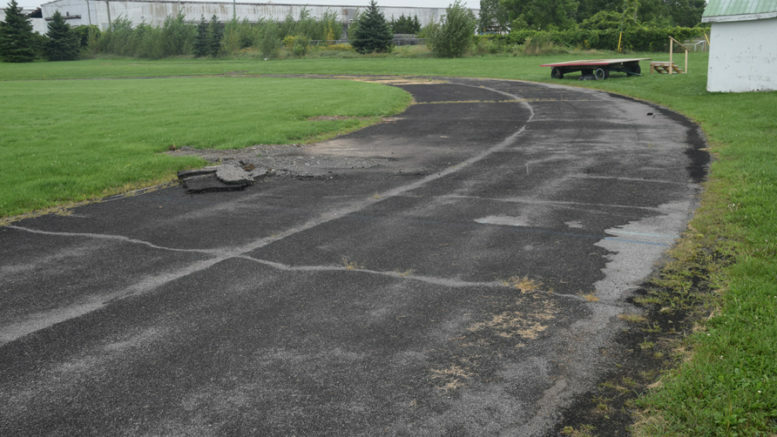 The outdated track at NDSS will be upgraded this September with a new rubberized surface. Photo by Adam Prudhomme. NDSS Golden Hawks’ student-athletes will soon have a new “nest” for their running events. Construction of the high school’s rubberized track is expected to begin next Tuesday, which just so happens to be the first day of class. After a lengthy search by Limestone District School Board, Strathmar Trenching was awarded the tender. If nature doesn’t co-operate, the final process could have to wait until spring. Pincivero says replacing the worn out track has been a goal of hers since the day she arrived at the school. Pincivero says the project really got going thanks to a $12,500 donation from the organizers of the Napanee Heritage Run. One drawback to the construction is that the football field will be unsuitable for the next two months, meaning the Golden Hawks football teams will have to play their entire KASSAA season on the road. Pincivero says the coaching staff has been great however, willing to make the sacrifice for the greater good. Once the new track is in place she hopes to further upgrade the school’s track equipment by adding hurdles. As for the colour of the new track, as spiffy as it may have looked, it won’t be navy blue and gold. As a result, they went with the more traditional pink and white.